Toyota's current ICS function detects obstacles and helps prevent or mitigate collisions caused by rapid acceleration after pedal misapplication. The new ICS includes more sensors and can detect objects further away, contributing to an increase in scanning depth and breadth. In addition, the control logic has been improved to help prevent or mitigate collisions with adjacent vehicles or obstacles even when pedal misapplication is not the cause, such as during low-speed driving in parking lots or when pulling out of parking spaces. 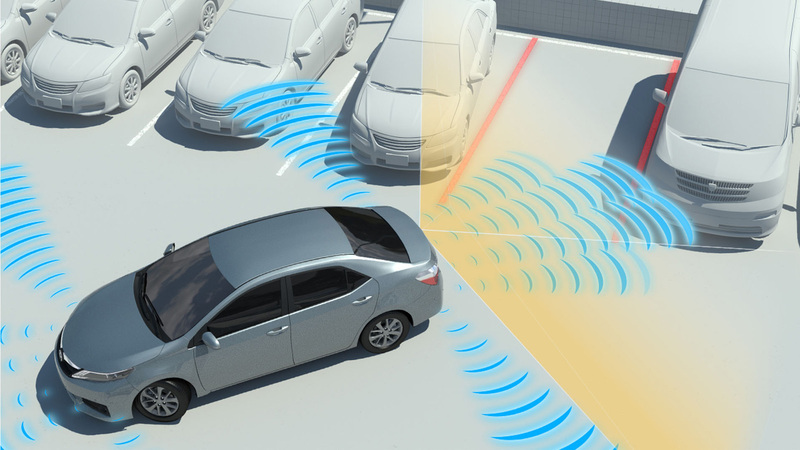 Toyota's Intelligent Parking Assist system now uses ICS to help prevent or mitigate collisions through automated braking. In addition, a new multi-point turn support function automatically controls steering2 in tight parking spaces requiring repeated back and forth movements. Another partially-automated2 function assists departure from parallel parking spaces with little room in front of and behind the vehicle. The Panoramic View Monitor—which currently displays an overhead view of the vehicle on the navigation system screen—has been enhanced with a new See-through View. Pressing a button allows the driver to flip between Moving View, which displays video as if looking down on the vehicle, and See-through View, which gives a drivers-perspective view of the vehicle's surroundings as if the vehicle itself were transparent. Compared to Moving View, See-through View displays obstacles larger, making them easier to identify. 2The driver controls the gear shift, brakes and accelerator .